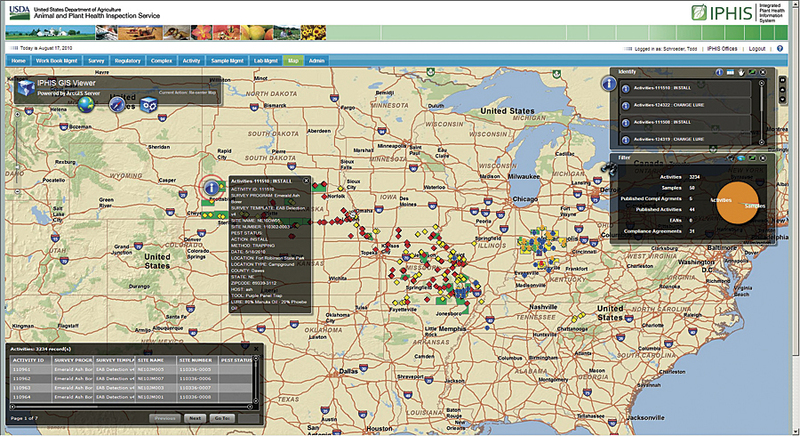 APHIS developed the GIS-based, enterprise-wide Integrated Plant Health Information System. GIS helps USDA manage operations so that APHIS can quickly respond when the nation's agriculture and forests are threatened. ArcGIS has helped USDA achieve its goals by improving standardization, accuracy, consistency, and data exchange. With an increasing global population, rapid changes in weather patterns, and greater pressure on international agricultural production and safety, the United States Department of Agriculture (USDA) has expanded its focus on national agricultural issues to encompass a more global perspective. Today, USDA not only analyzes and sustains the needs of the American farmer and consumer through domestic initiatives but also assures the quality of US agriculture to foreign trading partners to protect it from restrictions. Over the years, GIS technology has become an essential tool at USDA to support its efforts. APHIS users see a comprehensive view of local activities and have the ability to drill down to detailed data at a specific location. Customizable charts provide operational statistics. Says Todd E. Schroeder, USDA Animal Plant Health Inspection Service (APHIS) director of Business Systems Management, "We have known for some time that while there are immeasurable benefits derived from the increase in domestic and international agricultural trade, it also poses some risks because of the possibility of the accidental introduction of foreign species that can imperil a country's food production capabilities. With our recently implemented enterprise GIS, we are now able to better track potential problems and take remedial action when necessary." USDA began its use of GIS more than 25 years ago with the development of land-cover and agricultural basemaps from its existing collection of aerial survey data. An enterprise-level GIS license followed, implemented at APHIS. This agency's responsibilities are broad and include protecting and promoting US agricultural health, regulating genetically engineered organisms, administering the Animal Welfare Act, and carrying out wildlife damage management activities. In the event that a pest or disease of concern is detected, APHIS instigates emergency actions with affected states or regions to quickly manage or eradicate the outbreak. This aggressive approach has enabled APHIS to successfully respond to potential pest and disease threats to US agriculture. To meet its responsibilities, APHIS has implemented GIS-based projects across the country to address various agricultural and natural resource issues. These projects include monitoring the Asian long-horned beetle and emerald ash borer, alien pests that have destroyed millions of hardwood trees, and the development and implementation of the Citrus Health Response Program, which helps the agency advise the US citrus industry and protect it from invasive species. To be successful, APHIS relies on joint efforts between growers, federal and state regulatory personnel, and researchers. This allows the agency to sustain the sharing and consolidation of data resources in its various initiatives and inform and enhance the decision-making process. Due to the collaborative nature of its work, APHIS needed a nationwide GIS to provide a clear and complete picture of American agriculture and the natural resource landscape that would help the agency maximize the benefit from its various initiatives and meet the goals of USDA. In addition, stakeholders needed real-time data that is secure and easily accessible to be used for planning and operations. 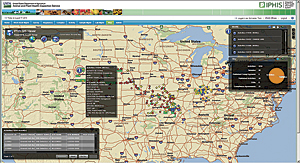 In 2009, APHIS developed the GIS-based, enterprise-wide Integrated Plant Health Information System (IPHIS). The application is currently being implemented state by state for use by all plant health responders. IPHIS provides a real-time system that allows users from any APHIS-supported project to see plant health activities in their district, share data about regional pest infestations, and view national quarantine areas. The system tracks infestations and diseases that impact plants and documents the response. The IPHIS system, with its underpinning GIS technology, helps USDA manage operations, increase efficiencies, and track scientific progress more accurately so that APHIS can quickly respond when the nation's agriculture and forests are threatened. The IPHIS system's GIS software includes ArcGIS for Server, ArcGIS API for Flex, ArcObjects, and basemaps (street, imagery, relief) from ArcGIS Online (arcgis.com), allowing disparate geospatial data from across the country to be compiled onto a single platform for analysis. This helps APHIS study the data entered by its field crews, providing a program-wide ability to detect and track invasive species of plants and insects. In addition, the GIS allows APHIS to analyze infestation patterns and make clear decisions on its efforts to control invasive species. ArcGIS has also provided APHIS with the ability to perform boundary mapping, route planning, risk analysis, and data filtering and use quality control indicators. Historic GIS data is used to see trends and predict the spread of pests. IPHIS allows users to create customized views of specified projects and provides the ability to drill down to detailed data at precise locations. Customizable charts can easily be generated to visualize operational statistics. IPHIS has improved communication and transparency by sharing information between other programs and allows access to cooperating entities, such as diagnostic laboratories at state, local, academic, and industry sites. This approach has provided APHIS with a modern, comprehensive, and scalable plant health data management system that promotes sustainable agriculture and safeguards the nation's food supply. Concludes Schroeder, "The enterprise approach has improved efficiency by integrating and leveraging our existing plant health IT systems and isolated GIS programs, reducing redundancy throughout our network. As a vital part of IPHIS, GIS has helped USDA achieve its goals by improving standardization, accuracy, consistency, and data exchange. In addition, it allows decision makers and scientists to manage current USDA activities and develop and implement long-range plans." For more information, contact Todd Schroeder, director, Business Systems Management, USDA-APHIS (e-mail: todd.e.schroeder@aphis.usda.gov).